Very kind and helpful staff, the room had everything we needed, good location, close to supermarket/bus/etc. Value for money. I was in Room No 2 and had a lovely view without even having to move from my bed!!. It was also lovely sitting on the balcony late at night. Excellent air con, regular room service and super comfy bed. Excellent location and value for money. V short walk from Centre of Pappadiamanti Street and just two mins from a supermarket on the way into the main part of old town. . The room had one double bed and two bunk beds. I was there by myself and found the room fine but with more than 1 or 2 people I think this would be cramped ....... but then again possibly worth it for the very good price. Handy fridge and very good wi fi. .
After telling the lady we were not happy to stay in a room for smokers, she promptly changed us to another, even better room with a balcony and better view to the city. The location of the apartments is very good, main stores and supermarkets just around the corner, not far from the port. room was very comfortable and clean. Staff very pleasant. I felt that I could ask anything of the staff there, it was perfect for my needs. La posizione che ti permette di raggiungere il centro di Skoathos in 2 minuti a piedi. La stanza era spaziosa e incredibilmente anche la doccia! Direi una rarità negli studios delle Sporadi. Struttura veramente comoda nel centro di Skiathos. Personale decisamente accogliente e sempre disponibile. Credo siano gli stessi gestori della Pensione Elisa. Ottimk rapporto qualità/prezzo. Πολυ καλη τοποθεσια,διπλα σε ολα.τα δωματια κλιματιζονται . Μας αρεσε που ειμασταν στο κεντρο και ολα ηταν μεσα στα ποδια μας. Καθε μερα εμπαιναν και καθαριζαν το δωματιο, ολα ηταν τακτοποιημενα. Πρωινο δεν ειχαμε ηταν επιπλεων η χρεωση οποτε δεν εχω αποψη. Υπήρχε room service κάθε μέρα, με στρώσιμο κρεβατιού, καθαρές πετσέτες κ.λπ, το ψυγειάκι ήταν αρκετά ευρύχωρο, ενώ στη βεράντα υπάρχει και σχοινί απλώματος με μανταλάκια. Πολύ καθαρό και λειτουργικό. Located in Skiathos, 5 miles from Lalaria Beach, Pension Butterfly has a garden and rooms with free WiFi access. Featuring a 24-hour front desk, this property also provides guests with a terrace. All rooms are equipped with a flat-screen TV with satellite channels. At the guesthouse, the rooms are equipped with a balcony. Rooms contain a private bathroom with a shower and a hair dryer. Guest rooms have a desk. 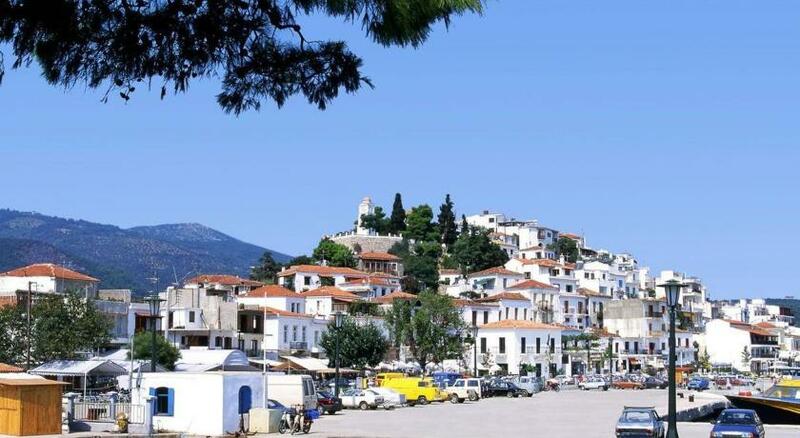 Skiathos Port is a 6-minute walk from Pension Butterfly, while Papadiamantis' House is 1,800 feet away. The nearest airport is Skiathos Airport, 1.2 miles from the property. 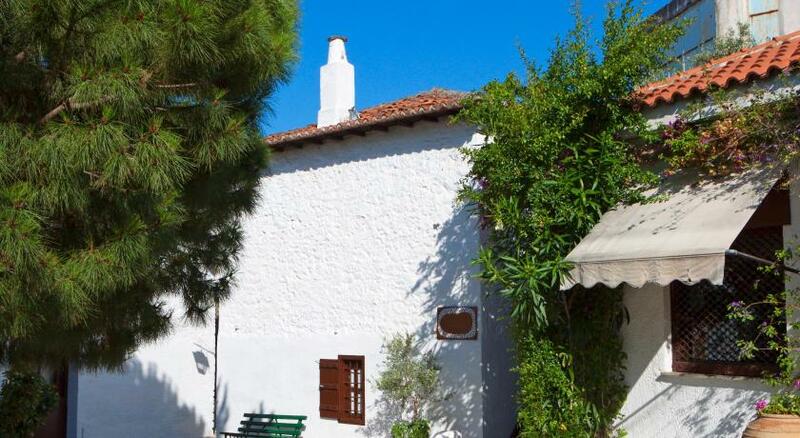 뀐 Located in the top-rated area in Skiathos, this property has an excellent location score of 8.3! When would you like to stay at Pension Butterfly? This quadruple room features a balcony, air conditioning and soundproofing. House Rules Pension Butterfly takes special requests – add in the next step! Pension Butterfly accepts these cards and reserves the right to temporarily hold an amount prior to arrival. Inadequate sound proofing: could hear other guests when they spoke loudly and bikes from the street below. Beds were very squeaky. A little bit noisy, would prefer a kettle to a TV. Great location, good value for money. No hair dryer we had to share one with my daughter who had a ground floor room and we were on the first floor. The balcony was just iron railings in front of the glass doors so mo where to sit outside. Shower room tiny you could sit on the loo, take a shower and clean your teeth in the sink all at the same time it was so small! Air con was so noisy you couldn't sleep so it had to be turned off. Street very noisy. Except for the maid, I never saw anyone else after my passport was checked. There was a sheet of paper on a desk down stairs with two telephone numbers on it that I could call if I needed help. I never did. Very strange. Paper walls, small rooms (smaller than I anticipated). Staff unavailable. I was charged 5 Euro for breakfast which was cold instant coffee and a white bread toasted sandwich. A bit confusing when I first arrived as there was no sign up (luckily the taxi driver knew it but none of the friends I was visiting had heard of it/knew where it was as I believe this only opened this year). Also, it wasn't clear that the Pension Butterfly is "part of " Pension Eliza next door and that was where you had to go for breakfast. Rarely anyone at Reception at Butterfly but when I needed help I located staff in the room adjacent to the kitchen room in Pension Eliza and they were friendly and helpful. It was really hard to find it there was no sign for the place. It was so cheap and close to town. we asked for a non-smoking room but when we arrived we were given a room with a strong smell of cigarettes and an ashtray inside. The room did not look to have been freshed.